The patent-pending Combo controls the placement, weight and motion of the golf clubs, greatly increasing stability on the course. The materials used on the Combo bag body are chosen for durability and long life. Should the golfer need to replace it after years of use or damage, it is possible to easily change the bag out of the frame. Lift-assist straps for loading the cart into the trunk. Combined Weight: 25 lbs. 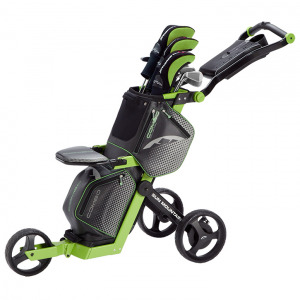 Folded size: 13" X 19.5" X 36"
If you have any questions regarding the 2015 Sun Mountain Combo Golf Push Cart, please give us a call, we would be happy to help you with any questions you may have. Write an online review on the 2015 Sun Mountain Combo Golf Push Cart, and share your thoughts with others.